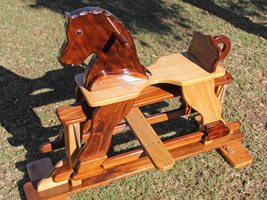 'Are you looking for a Christmas present? 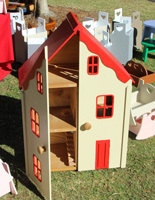 Do you want to help in the work against Human trafficking in Australia and beyond? 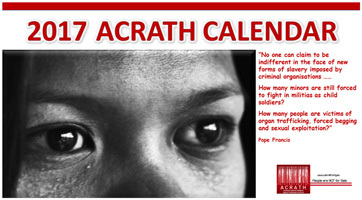 The 2017 ACRATH calendar is now available. Members of the Marist House of Welcome community, Paddington, Brisbane, joined PNG Catholics for their end-of-year celebration last weekend. 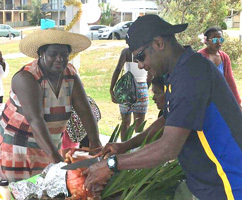 The Bribie Island gathering featured a traditional roast pig event over which Bougainvillean, Fr Chris Ketsore SM, presided. PNG and Bougainvillean youth groups also attended. 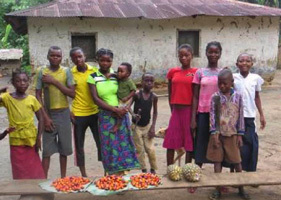 From Holy Name of Mary parish, Hunters Hill, Fr Kevin Bates reports on the link between the parish's Social Justice group and 'HandUp Congo'. The small non-government agency, staffed mainly by Australian women, says 'A hand up is better than a hand out'. Throughout the Church and the Marist world Advent's countdown to Christmas has begun. 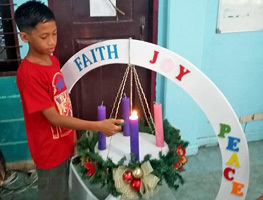 Above: Advent wreaths... Balay Pasilungan, Davao / St Joseph's Hostel, Hunters Hill. 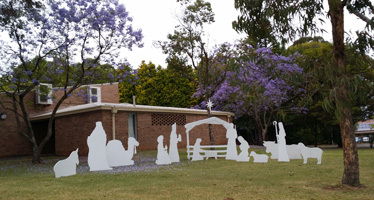 Below: Indigenous beginning to Advent, St Patrick's, Church Hill / Thai-made Advent calendar, Villa Maria monastery | Parish crib, Holy Name of Mary, Hunters Hill / ...last year's sheep rustling 'crime scene'. 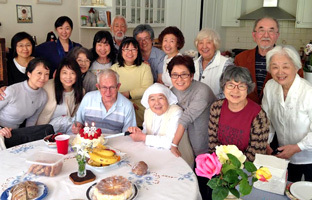 Three Marists with 'round figure' birthdays were honoured at a combined celebration at the Maryvale-Montbel community, Hunters Hill, on Nov 24. Fr Tony King had recently marked 90 years while Fr Chris Austin and former provincial, Fr Bill Ryder(pictured), celebrated 80 years at a soirée on Fr Bill's birthday. Three states were represented in Melbourne, Nov 18-20, for a retreat preached by Fr Paul Glynn SM for the Japanese Catholic community. 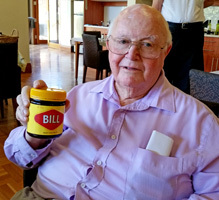 Retreatants took the opportunity during the weekend to honour Fr Paul's recent 88th birthday. Organisers from St Patrick's, Church Hill, advise of the forthcoming 'Carol Walk', from St Mary's cathedral to St Pat's, Sat, Dec 10. 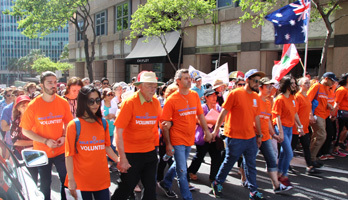 Thousands of Catholic Sydneysiders turned out on Sunday, Nov 20, to celebrate Christ the King in the city's downtown precinct. Commencing at the Eucharistic shrine of St Patrick's, Church Hilll, a procession led by Sydney's three auxiliary bishops wound its way to St Mary's cathedral for Benediction by Archbishop Anthony Fisher. 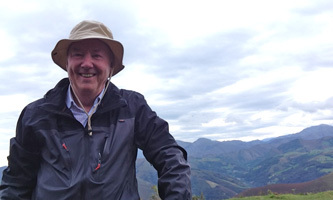 After 800 Km walking the Camino de Santiago in northern Spain, Fr Ray Chapman sends images and his reflection on an experience both 'hard and beatutiful'. "While walking the Camino de Santiago recently, I met a young Austrian woman who described the Camino as being both 'hard and beautiful'. Her description caught me by surprise. 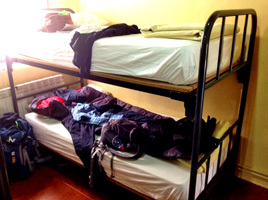 Not only did it speak authentically to my own experience but it seemed to encapsulate perfectly the deep significance and richness of the Camino. The Camino is certainly hard. At times it is gruelling! Walking 800 kms in 31 days, over mountains and hills, in the heat, rain and snow, looking for a new place to sleep each night, certainly challenges even the fittest. But it is also beautiful. The Camino entices a participant to become a pilgrim; to learn how to spend time with oneself; to reflect deeply on life. 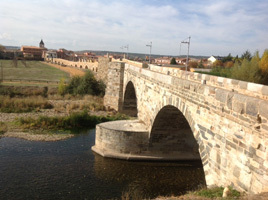 Those who walk the Camino embrace a profoundly emotional and spiritual experience, made richer by the companionship of those who walk beside and with them, no matter from which country and culture they come, or to which religious affiliation they belong (or do not), or from which age group they come. The joy and fulfilment of the Camino can only be experienced by those willing to endure the tough challenges it presents. It truly is 'hard and beautiful'." Marist aspirant, Hayden Kennedy (Brisbane), has been accepted by the Australian province of Marist Fathers as a postulant for 2017. 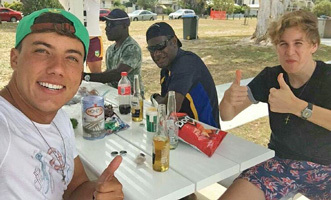 Well-known as a key figure at the Marist House of Welcome ('Bethany'), Paddington, Brisbane, Hayden shares in the ministry of offering hospitality to a wide spectrum of visitors and groups. Congratulations, Hayden! The Marist world rejoices on the priestly ordination of two members of its Asia District, Frs Roque Rebito SM and John Guo Wang SM. The ceremony took place in Davao Cty, southern Philippines on Nov 17 in the presence of superior-general, Fr John Hannan SM, other Marists, diocesan clergy, family and friends. 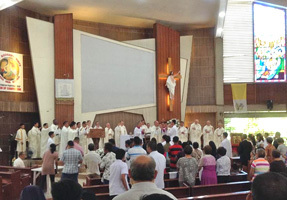 Davao's archbishop Most Rev Romulo Valles presided. Fr John is the first Chinese to be ordained as a Marist priest, an historic and significant moment in the Society of Mary and the church of Asia. Congratulations, Frs Roque and John ! The annual procession from downtown Sydney to St Mary's cathedral takes places this weekend on the Feast of Christ the King, Sunday, Nov 20. Organisers from St Patrick's, Church Hill, advise: 'Please assemble at Pitt Street, between Hunter Street and Martin Place (this section of road will be closed for us to assemble), at 2pm. 'The Blessed Sacrament will be brought to meet us there from St Patrick's, Church Hill. We encourage you to use public transport. Get off at Wynyard Station and take the George Street exit. 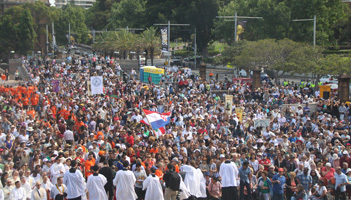 'At the conclusion of the Procession, St. James Station is a short distance from St. Mary's Cathedral. 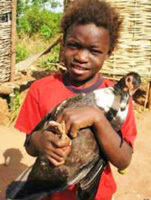 Download the latest newsletter from the Marist Mission Centre: click here. As the Marist world remembers, on Nov 15, the anniversary of the death in 1875 of the Society of Mary's founder, Jean-Claude Colin, they celebrate good news from France. At their conference in Lourdes, Nov 04-09, the bishops of France approved with a massive vote the reopening of the beatiﬁcation cause of Marist Founder, Jean-Claude Colin. It was Cardinal Philippe Barbarin, archbishop of Lyons, who is in charge of the cause at the diocesan level, who asked the approval of the French bishops. Oceania Marist bishops Ghislain de Rasilly (Wallis and Futuna) and Michel Calvet (New Caledonia) were present at the vote and communicated the joyful news to fellow Marists. Above: Fr John Hannan (far left) presides at the Chapter's closing Mass in Davao | Below: Opening ceremony, with District Superior, Fr Pat Devlin, and other moments in the Chapter. Superior-General, Fr John Hannan, SM, accompanied the members of the Marist District of Asia during their recent Chapter. 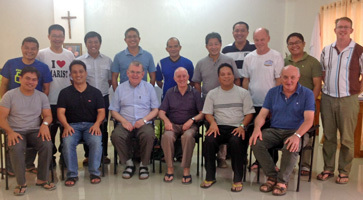 Held in the Phlippines city of Davao, Mindanao, the Chapter's agenda explored ways of relating to other parts of the Marist world including Australia. 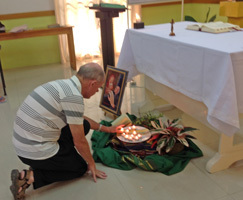 From Suva, Fr Tony Kennedy sends the latest newsletter from Marist College.. 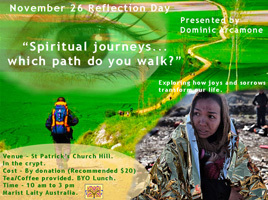 Presented in the crypt of St Patrick's, Church Hill, Sydney.by Dominic Arcamone. 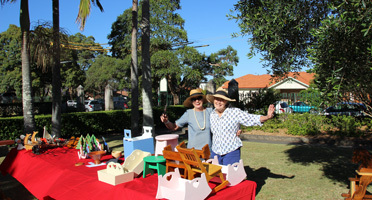 Nov 06 saw Christmas shopping at Holy Name of Mary church with the annual toy and handicraft sale of Hunters Hill-Ryde Mens' Shed. The Shed opens twice weekly in the historic workshop of Villa Maria monastery where industrious retirees work on family and community projects. 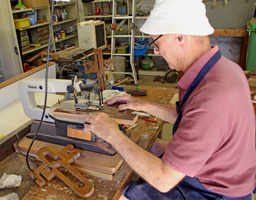 In his adjacent workshop Br Terry Garrett SM (pictured below) maintains a Marist presence at the Shed and creates his own handiwork for family and friends. Marists were among the two hundred religious who gathered on Nov 04 to commemorate their faithful departed at Nudgee cemetery, Brisbane. 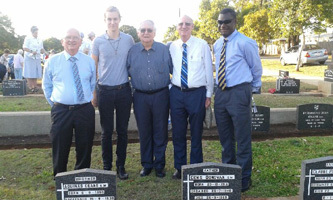 The graves of seven Marists of the Australian province buried at Nudgee were visited by Brisbane-based SMs and other Marist Family members. 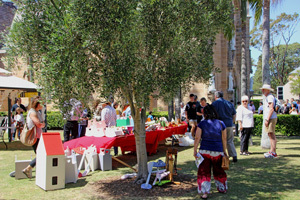 The event was followed by a dinner for religious which was addressed by Brisbane's Archbishop Mark Coleridge. Above: Br Charlie Randle, Hayden Kennedy, Frs John Worthington, Gerard Hall and Chris Ketsore / .. with Br John Thompson FMS and Ms Caroline Thompson (Marist Charism & Culture). Below: The graves of Brs Michael Cunningham and Aquinas Dean, Frs Paddy McCarthy, Richard O'Sullivan, Leonard Bourne, Denis Donovan and Claude Palmer. 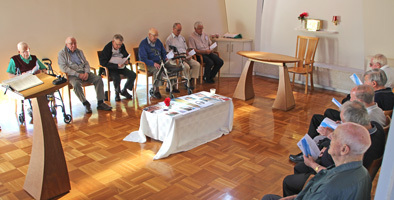 Members of the Maryvale/Montbel retirement community, Hunters Hill, were joined by neighbouring Marists on Nov 02 to pray the evening Office of the Dead.